Guest post by Mark Fidelman, CEO of Evolve! Capital, Inc., and author of Socialized! How the World’s Most Successful Businesses Harness the Power of Social. Today’s socially savvy, constantly connected consumers expect more from brands, and organizations that rely on traditional arm’s-length relationships with customers and who try to dictate the relationship rather than participate in it will find it increasingly difficult to succeed. The increased use of social technologies over the past few years has forever changed the relationship between customer and brand. Now, individuals can create viral videos that reach millions, blog posts that embarrass corporations, and Facebook pages that organize citizens to oust dictators. Some companies have already recognized these trends and are capitalizing on them in a big way; others haven’t figured out how to be social smartly and stumbled publicly on the social stage. As the examples in my new book Socialized! show, the best way for people to learn about social media is through real life examples. In that spirit, here are a handful of organizations that got social media right and those who got it wrong in 2012.. The jump heard round the world: Red Bull. Red Bull brought new meaning to its tagline, “Red Bull gives you wings,” when, on October 14, the company sponsored Felix Baumgartner’s sound-barrier breaking, record-breaking free fall from space. Using social media, the company successfully built up huge buzz around the event and weeks before the jump, Twitter, Facebook and other social media channels were ablaze with interest. Traditional media chimed in just days prior to the jump and covered it live. What companies should take away from Red Bull’s space jump is the magic of choosing the perfect event for their brand, making it easy for people to connect with it. Of course, not every company can afford to sponsor someone’s jump from space, but you can as a brand sponsor something related to your product or service and see a huge impact. The twist: Oreo. To celebrate Oreo’s 100th anniversary, Nabisco launched a brilliant social media campaign called the 100-Day “Daily Twist” in which a different Oreo cookie design was featured every day for 100 days. It kicked off the campaign with a seven-layered, rainbow cookie in honor of gay pride, which quickly went viral. Other cookies included designs commemorating the Mars rover landing, Elvis Week, the Dark Knight premier, tennis, and so on, brilliantly providing the company with a way to target a wide variety of consumers they hadn’t been able to reasonably directly approach in the past. This campaign was a great way for Nabisco to turn their Oreo cookie into a brand that really stood for something meaningful. It was a great way to help many different groups of people create an emotional connection with the product. As a result, the company saw a significant increase in fan interaction via social media. The bright idea: Domino’s ThinkOven. Domino’s ThinkOven was an effort to encourage customers to submit their “best Domino’s ideas” to the company. Whether it was an idea for a new uniform, a new dish or something for the restaurant, Domino’s opened the door wide to its customers’ ideas. Domino’s then rewarded their best idea-generators. The more you involve your customers in the development of a product or service, the more emotionally invested they’ll be in your company. And also, the more likely you are to get that product or service exactly right. Before social media, it was much more costly and difficult to get customer input using focus groups. With social media, research can be ongoing. Not that “Happy”: McDonald’s. In mid-January, McDonalds launched a Twitter campaign using the hashtag, #McDStories, asking users to post nostalgic stories about Happy Meals. However, this campaign quickly took on a whole different meaning, as Tweets using the hashtag came pouring in about horror experiences and shocking tales. From poor work conditions to appalling food quality, McDonald’s campaign turned negative attention back to itself. McDonald’s should have been more careful about groups like PETA (People for the Ethical Treatment of Animals) that would react negatively. They also showed a lack of knowledge about what the best social medium to use for this type of campaign was. McDonald’s chose to use Twitter, but really Twitter is far too wide open for a campaign where this kind of feedback is likely. Next time, they should use a moderated forum such as Facebook. Not that into you: Toyota. During the Super Bowl, Toyota planned a major Twitter campaign meant to promote the Camry. But instead of creating their own hashtag, the Camry Twitter accounts started tweeting at anyone using the #Giants or #Patriots hashtags. As you may have guessed, even with a potential prize in play, not everyone cheering for a team wanted to be spammed by a Toyota Camry. Toyota intended to engage users by directly tweeting them. However, this had the opposite effect: users accused Toyota of bombarding and spamming them with unsolicited messages. Toyota made the mistake of focusing too much on themselves rather than the Super Bowl and fans, and while they quickly suspended the accounts, this campaign still resonates as an example of a failed, large-scale endeavor. The key in these social campaigns is to promote the initiative, not to talk about yourself. When you try to make it all about you from the get go, you’ll only succeed at alienating people. Not that smooth: Belvedere Vodka. A picture says a thousand words, and as Belvedere Vodka discovered, sometimes pictures insinuate far too much. The company would often put up cute and/or humorous ads on its Facebook and Twitter pages. It hit a snag; however, when it put up an ad that seemed to promote sexual violence. The company received a significant amount of negative feedback, had to apologize for the ad, and made a hefty donation to RAINN (an anti-sexual violence organization). With social media campaigns, because the messaging can spread so quickly and there’s no censorship board to screen it, you have to be very careful about what image or message you put out there. Especially if you’re trying to convey humor or use an overly aggressive visual, you better be certain that it cannot be misconstrued. The message needs to be crystal clear, and you need to make sure that it is absolutely the message you want to be sending. Sometimes companies want to just throw up a message or an image because social media makes it so easy to put content out quickly. But you must carefully vet these messages. Rest assured, they will live on forever. Case and point, Belvedere took the ad down from its social networking pages, but with a simple Google search, you can still easily find the ad and learn about the controversy that surrounded it. We’re drawing ever closer to a business environment where simply relying on traditional media and one-way communications to reach customers is going to leave you well-behind your socialized competition. Like it or not, the moment of truth is upon us. Adapt or die. 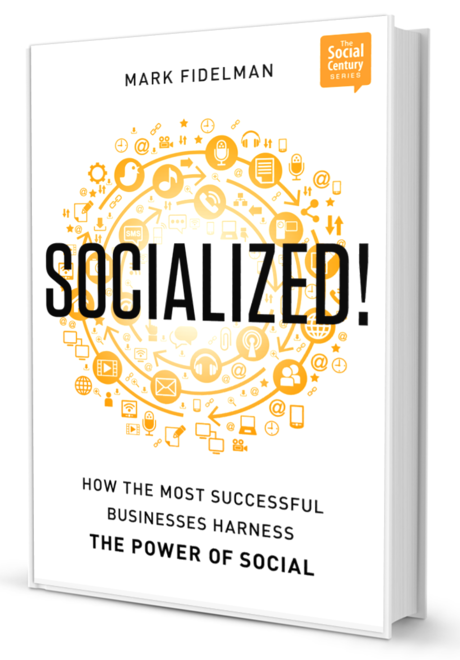 Win a free copy of Socialized! Head over to Social: IRL’s Facebook page for a chance to win your free copy of Socialized! Two winners will be drawn at random. Deadline for entry is 8pm CST on January 4, 2013. Note – If you entered last week’s drawing, you’re automatically re-entered this week, no need to enter again.